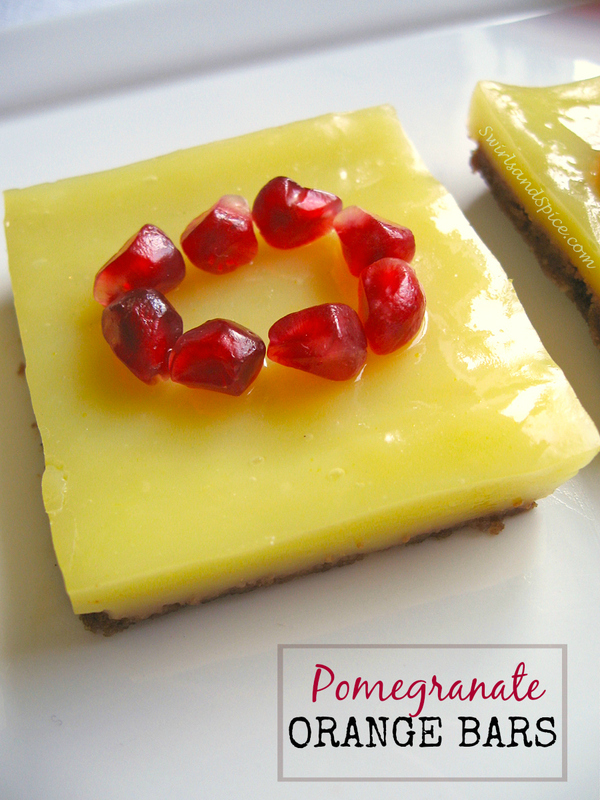 Sparkling red pomegranate atop tangy orange bars make a lovely and refreshing addition to the dessert table. 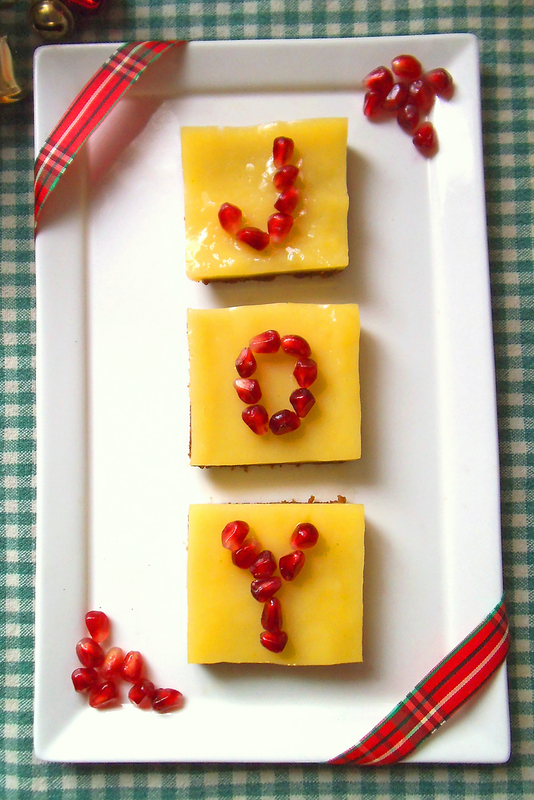 For extra fun, I spelled the word “JOY” with pomegranate arils. But what you write (or don’t write) is up to you! 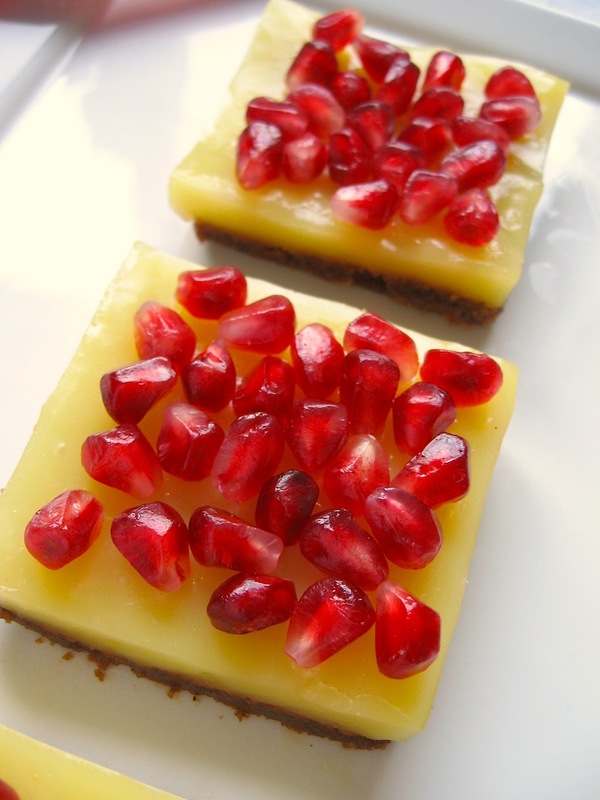 The bars look even more colourful with a generous sprinkling of pomegranate rubies. May your heart and home have room for joy this holiday season. In a medium saucepan, whisk together sugar and cornstarch. Stir in 1 cup orange juice and water. Bring the mixture to a boil over medium heat, whisking frequently to avoid clumping. Turn heat down to simmer until a thickened sauce forms. Remove sauce from heat. In a medium bowl, lightly beat two egg yolks and gradually pour in the hot orange sauce, whisking to mix them well. Return orange sauce with yolks to the pan and heat to a gentle boil. Simmer for 2 minutes, stirring constantly. Pour hot sauce onto cooled cookie crust in baking dish. Let cool on a wire rack for 45 minutes. Cover and chill for 1 hour or more. Meanwhile, whisk remaining 1/4 cup orange juice with 1/2 teaspoon cornstarch. Bring to a boil in a small saucepan or microwave-safe glass measuring cup. Stir until smooth. Let cool in refrigerator until a slightly thickened sauce forms. To assemble orange bars, spread cold filling with orange sauce. Cut into 9 or more squares. Sprinkle with pomegranate arils or form letters as desired. Serve bars while still cool. *Note: To save time, you can grind up purchased gluten free cookies for the crust. To make your own cookie crust, use the recipe below. Preheat oven to 325 degrees F (160 C). In a small bowl, combine flours, salt, and baking soda. In a separate bowl, blend together egg whites, sugar, oil, and vanilla. Whisk the dry ingredients into the egg and sugar mixture until a smooth batter results. Line a large baking sheet with very lightly greased parchment. Spread batter onto parchment as a thin, even layer. Bake for 15 to 18 minutes. Remove warm cookie brittle from oven and allow it to cool completely on the tray. Then break the cookie brittle apart into shards and separate the pieces. Flip the pieces over on the baking tray and return to the oven and bake at 275 degrees F (135 C) for about 10 to 15 minutes. Allow the pieces of cookie brittle to cool completely until they are crisp. In a food processor or with a rolling pin, pulverize the cookie brittle until small crumbs are formed. Measure out 1 cup of crumbs and mix with 2 tablespoons of melted butter or coconut oil. Press into pan or baking dish. Bake at 300 degrees F (150 C) for 10 minutes or less. Allow the pan to cool completely before filling. Save remaining crumbs in a sealed bag or container for future crusts. Fiesta Friday, Savoring Saturdays, and here. My mouth literally watered just by the word ‘tangy’. 😀 These bars look really good. Nice presentation as well. Happy FF. 🙂 Have fun! I’m so happy to hear that. I simply love fruity desserts! This is so pretty. Love the way you wrote joy with pomegranate. Thank you, Sadia! The world needs more joy I think! These look soooo yummy, and so festive too! Thanks! I am a fruit gal when it comes to dessert! Have a wonderful holiday, Kelly!